Spikes in wheat, corn and sorghum prices, triggered by extreme weather, had driven tens of millions into poverty over the past 18 months. By April 2011, wheat prices were 85% higher on international markets than the year before, Oxfam said. Storms and droughts that have unleashed dangerous surges in food prices could be a "grim foretaste" of what lies ahead when climate change bites more deeply, Oxfam said on Monday. 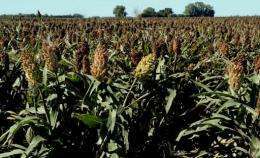 In a report issued at the start of UN climate talks, the British charity pointed to spikes in wheat, corn and sorghum prices, triggered by extreme weather, that had driven tens of millions into poverty over the past 18 months. "This will only get worse as climate change gathers pace and agriculture feels the heat," said Oxfam's Kelly Dent. "When a weather event drives local or regional price spikes, poor people often face a double shock. "They have to cope with higher food prices at a time when extreme weather may have also killed their livestock, destroyed their home or farm, or stripped them of their livelihood. "This toxic mix of higher prices and lower purchasing power has driven many people into crisis this year," said Dent. "If we don't act in Durban, this pattern could become even worse." 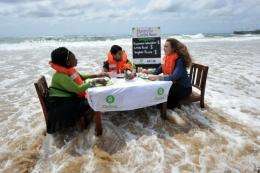 Oxfam activists stage a protest aimed at the conference of the UN Framework Convention on Climate Change in Durban, South Africa on November 27. Protesters calling for "climate justice" are set to gather on November 28 at the opening of UN climate talks in Durban. In 2010, a heatwave in Russia and Ukraine sparked a rise of 60 to 80 percent in international wheat prices between July and September. 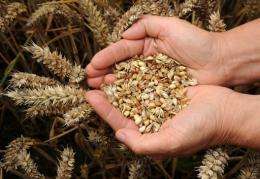 By April 2011, wheat prices were 85 percent higher on international markets than the year before, Oxfam said. In July 2011, the price of sorghum was 393 percent higher in Somalia, while corn (maize) in Ethiopia and Kenya was up to 191 and 161 percent higher respectively compared with the five-year average, reflecting the impact of drought in the Horn of Africa. Rainstorms and typhoons in Southeast Asia, meanwhile, have driven up the price of rice in Thailand and Vietnam. In September and October, the cost of this staple was 25-30 percent higher there than a year earlier. And a major drought in Afghanistan helped push up wheat and wheat flour prices there to 79 percent higher this July than the previous year. In February, the World Bank estimated that 44 million people in developing economies had fallen into extreme poverty as a result of spiralling food prices. In February, the World Bank estimated that 44 million people in developing economies had fallen into extreme poverty as a result of spiralling food prices. In July 2011, the price of sorghum was 393% higher in Somalia. In the November issue of its "Food Price Watch" report, the Bank said that a global index of food prices peaked in February but had dipped by five percent since then. Even so, the index was still 19 percent higher than in September 2010, although the figure varied greatly according to the country and the commodity, it said. Oxfam said price hikes were a source of despair for the needy. "For the poorest who spend up to 75 percent of their income on food, price rises on this scale can have consequences as families are forced into impossible trade-offs in a desperate bid to feed themselves," it said. It pointed to a just-published investigation by the UN's panel of climate scientists, which said man-made global warming had already boosted heatwaves and flood-provoking rainfall and was likely to contribute to future disasters. "More frequent and extreme weather events will compound things further, creating shortages, destabilising markets and precipitating price spikes, which will be felt on top of the structural price rises predicted by the models," Oxfam said. It appealed to the conference of the UN Framework Convention on Climate Change (UNFCCC) to slash greenhouse gases and activate a planned fund to help poor countries. One goal of the Durban talks is to breathe life into a "Green Climate Fund" that, by 2020, would channel as much as $100 billion a year to countries most likely to bear the brunt of climate change. But approval has been held up by squabbles over the fund's design. Sorry, extremes in weather, especially when occurring during the growing seasons, have always impacted grain prices and always will. However, the insane government policies both fostering and resulting from the Global Warming Scam make these commodities far more vulnerable to price spikes than would otherwise be the case. Especially with corn, because of the ethanol mandates.